A symbiotic relationship is emerging between mainstream media (such as newspapers and broadcast), and social media (such as blogs, podcasts, and online social networks). Mainstream media and social media feed off each other. Blogs provide a vast public forum for discussion of content provided by major media. Leading blog search engine, Technorati, has enabled every online piece on The Washington Post, Newsweek and Associated Press newspapers to display the complete blog discussion about that article, turning an article into a conversation visible to all. At the same time, it has become common for mainstream media to quote blogs and bloggers, sometimes exclusively, and the conversations between bloggers often provide the ideas for media stories. Together, mainstream and social media create a single media landscape in which we can all participate. Strategic questions: How can you best draw on social media for content and ideas, and facilitate social media commenting on and annotating your content? Conversation is almost by definition the heart of social media. Relationships between people and ideas emerge in a very different fashion from the one-to-many configuration of mass media. Annotation is commentary on and reference to existing information and ideas. This will soon spread into geospatial annotation, where conversations are generated around physical locations. Self-exposure is a more powerful driver of social media than self-expression. The exhibitionism and associated voyeurism of blogs and social networks are a key factor driving participation, as Richard Watson points out. Access is a distinctive feature of mainstream media, whose representatives can reach almost wherever they want, by virtue of their position and power. Production capabilities are extremely high based on equipment and expertise. Consistency of output and quality assurance is expected, along with reliability – people know what to expect. Professionalism as a characteristic of mainstream media cuts both ways – there are clear standards and a high degree of talent, yet professionalism is a box that amateurs can easily step outside of to innovate. The history of media has been one of passive consumption. However, today one of the strongest social trends is towards participation. There are certainly many who are largely content to be “couch potatoes,” consuming the media they are given. Others – particularly younger people – are keen to create, by establishing blogs or individual spaces on sites like MySpace, or sharing photos or videos online. Even clicking on a link is a creative act that can impact what other see or don’t see. Yet this is not just about a social divide. Everyone of us is both a consumer and a creator. Finally today we have been given the power to create for others as well as to consume what we are given. Strategic question: Are consumers or creators more valuable in your business model? How can you encourage consumers to become creators? Content generatation requires both creation and filtering. Each of these two roles can be performed by either media, or their audience. Traditionally content has been created by journalists, and filtered by editors. Today “user generated content” has become a major buzzword, referring both to personal sites and blogs, and to content submitted to mainstream media, such as mobile camera photos or home video footage. However the emergent vitally important trend is user filtered content. Time Warner’s re-launch of the Netscape site as a user filtered news site is an important move. From another perspective, the Current TV model can be understood as user generated, media filtered media, which is being challenged by wholly user and media filtered properties such as YouTube. Strategic questions: What configuration of user and media content generation and filtering will you select? In particular, how will you implement user filtering? Much content is “embedded” into the media, making it only consumable in its original form. Yet through the many mechanisms of time shifting, space shifting, and format shifting, content readily becomes user-controlled. In addition, the emerging world of media is vigorously engaged in creating new formats. When the first mass circulation newspapers were produced in 1888, the concepts of newspaper headlines, lead stories, and photo captioning were yet to be developed, notes Art Kleiner, editor in chief of Strategy + Business magazine, in an interview for the Future of Media Podcast Series. It took several decades to develop what we now recognize as a standard format for newspapers. Soap operas were another format innovation that emerged after the birth of TV, that has stayed with us and evolved. The next decade or more will be an exploration of what formats will be attractive to audiences in a world of pervasive media. Strategic questions: To what degree – and how – do you impede or facilitate the shifting of time, space, and format to user-controlled formats? What format innovations will you experiment with to discover the winning media formats of the next decade? Two of the key features of emerging media are that its reach and impact are far more targetted and measurable than before. This drives are great willingness to spend advertisers and publishers. There are an array of traditional media revenue models that will continue in various guises, potentially driven by the emergence of micro-payments. Classifieds is rapidly disengaging from traditional media, though some companies are still managing to keep them connected. One of the most important shifts is that advertising is now often aggregated. Media can sell advertising directly, as the major publishers do. However now, by virtue of Google’s AdWords program and imitators, anyone can publish online and get advertising revenue without having to sell it. This is transformative in enabling the many of the “long tail” to move towards becoming viable – though small – media properties. Microsoft too is aggressively following the ad aggregation path. The emerging players in ad aggregation are both enabling a massive growth in media diversity, and stand to do enormously well in allowing advertisers to reach their target market, whereever they are turning their attention. Strategic questions: Are media content and classifieds natural partners, and if so how do you connect these effectively? Where are the aggregation points into which you can bring together or deliver highly relevant advertising? Channels and devices are distinct. There are an array of delivery channels for media, often not directly linked to media themselves. The devices through which media is delivered are critical leverage points to guide access to media, as Apple has proved with the iPod. The most fundamental shift is that both channels and devices are shifting to the mobile, rapidly enabling anywhere/ anytime consumption of media. Perhaps the most important example of this is video glasses. It is just this year that video glases have become high quality and comfortable, which along with the advent of mobile video content and devices, are making them a real consumer technology that is likely to take off big time. The availability of video displays everywhere will create a massive demand for video content, that will be fed not just by media and entertainment companies, but also by individuals who have cameras and home video production facilities. As display prices drop, every available surface, from coffee shop tables to umbrellas, will become a video screen for advertising and content. In time, e-paper, which is foldable or rollable, and can be instantly updated with the latest news or video, will begin to supplant print magazines and newspapers. Strategic questions: How can you leverage your presence in devices to content distribution or vice versa? How will you participate in the massive boom of video content demand? Online distribution means that any media can have global access. There is some content that is of truly global interest, such as celebrity news, some business and financial news, specialist topics, and some entertainment. This content can basically be produced anywhere, so expect to see global media content begin to be produced in surprising places. Yet much content requires localization – witness how often TV series are re-produced for different nations, let alone how much syndicated news is adapted locally. Some news, entertainment, and media is purely local in interest, but in many cases broader-interest content requires localization. Aspirants to global media positioning will need to understand and invest in the process of content localization. Strategic questions: How global or local in interest is your current content and distribution? What degree of localization is required in content, format, and distribution, and what capabilities or alliances are necessary for this? The Future of Media Strategic Framework is released under a Creative Commons Attribution-ShareAlike 2.5 License. This means that whiel Future Exploration Network retains copyright you can use it – even for commercial purposes – as long as you attribute it to the creator. It also means, that if you think it should be different or want to improve on it, you can do so as long as you release it under the same license – feel free to do so! There are a plethora of dilemmas and thorny issues for media organizations to resolve in how they protect their own content, as well as license user-submitted content. Locking content down will in many cases prove to be less valuable than allowing it to be reused appropriately by other content creators. A living content landscape benefits content creators far more than a rigid world. Strategic questions: What licenses do you offer for user-submitted content? In which situations should media-generated content have Creative Commons or similar licenses that allow reuse and adaptation? 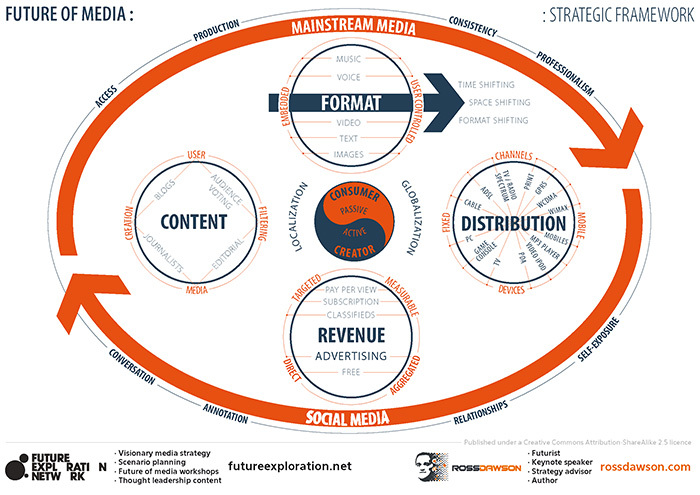 Overall questions on the Future of Media Strategic Framework: Where across the strategic framework are you currently playing (content/ formats/ revenue/ distribution)? How can you leverage your current presence into new domains? What partners or alliances do you need to generate the most value from your existing capabilities?